Ray Bradbury (1920 – 2012; first SF publication, 1938), despite his claim to the contrary, was an amazing author of science fiction. (He held that science fiction should be based on reality, and of his works, only Farenheit 451, depicting a future in which all books are banned, met that criterion. The others, including The Martian Chronicles, Something Wicked This Way Comes, The Illustrated Man and Dandelion Wine, were fantasies, because they weren’t possible in the real world.) The Martian Chronicles is definitely out of this world, describing the sporadic colonization of Mars by Humans, and their encounters with the native Martians. The Illustrated Man, Something Wicked and (especially) Dandelion Wine are rooted in Heartland America, which distinguishes Bradbury’s writing from just about every other author on this list. 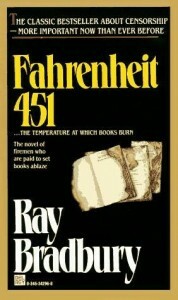 Fahrenheit 451 is (approximately) the temperature at which paper autoignites, and its protagonist is a “fireman” responsible for burning any book that he finds (and sometimes the entire house around it, as well). He gradually realizes the loss to society and finds a small group of people who are each memorizing a work of literature, for when books will once more be allowed. I suppose you could say they metaphorically mirror the Fireproof Paper that Bradbury exports.